Actually, there is a third choice. If you really don't want to succeed, you can disagree with the feedback. This, I think, is a little extreme. It also conflicts with the idea that any product, including a web application, benefits from a strong vision. Obviously, disagreeing with all feedback would be plain stupid, but I can't quite accept that all feedback is relevant. Anyway, this is a minor point. Designing for the social web is a great little book, and deserves to become a classic. Highly recommended. I've just finished reading "Mobile Web 2.0" by Ajit Jaokar and Tony Fish, published by Futuretext. The authors have a wealth of experience of the mobile telecommunications field between them, quite enough to know what a nightmare it is for application developers to engage with mobile operators. In a nutshell, the message from this book is to bypass the walled gardens and the endless hurdles put up by the telcos, and go direct to the customer using the web. So far so good. Obviously, there are certain limitations associated with the mobile web, in particular the fact that practically nobody in the real world uses it. Partly this is because of usability issues, both in devices and in delivery, partly because of cost, but I suspect largely due to the lack of any compelling reason. Well, perhaps we can at least do something about the last part, and the authors do, to some extent, point the way. However, although the authors may be industry experts, I'm afraid their writing and editing skills are seriously substandard. This book puts me in mind of the "I'm going to read your my Powerpoint bullet list slides" experience. It is disjointed, repetitive, hopelessly formatted (really, it is straight out of Microsoft Word, and incompetent MS Word at that). It isn't just the mechanics of writing which are at fault. Often they start to present an argument, and just. Er, stop. The frequency of either "so what ?" or "pardon me ?" moments increases as the book goes on. The endless clumsy incremental summaries are also pointless filler. It isn't so much that they don't what they're talking about - I wouldn't want to imply that - but one does wonder if they ever reviewed any part of this serial braindump. I'm not expecting Shakespeare, but even technical writing needs to come up to a certain standard of literacy and layout. Especially when it is being sold. There are other issues that annoy me: there is a strong underlying theme of playing to the "Web 2.0" gallery: these guys so much want to be the Tim O'Reilly of Mobile Web 2.0. Fine, but cut this out and the book would be far more readable and considerably shorter. Another thing is on consumer created content (same point really)... I'm sorry, but no way does Joe Bloggs in Seat 54, Row 91, Stand A, filming a World Cup game with his SonyEricsson V800 compete with a professional cameraman on the touchline. Get real guys - do you seriously think FIFA was worried about this stuff ? Never mind "spot the ball" - you'd be lucky to spot the pitch! Even if we accept the ridiculous statement that mobile phone video is up to "DVD quality" (actually a meaningless statement, but never mind), and even if we rule out the difference between a camera phone lens and a broadcast quality zoom, the skill of the operator plays an extremely significant part. I know you want to be quoted and loved by the Blogosphere, but come on....get real. The emphasis on mobile TV seems way off-topic. DVB-H, DMB etc are broadcast technologies on a totally separate layer. It has nothing much to do with mobile communication, it simply co-exists. If we define "web" as a collaborative medium enabled largely by TCP/IP, then DVB-H doesn't come into it. 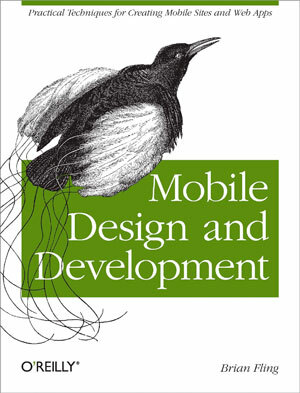 As a free download, or a collection of blog postings, "Mobile Web 2.0" would be worth a read. But at £20 from Amazon, sorry, it isn't worth it. "With icConcept, you can capture requirements both manually and automatically." Wonderful. Let's buy this, then we can just turn it on in the morning, browse the web a bit, have a few coffees, go out for a couple of beers, catch a movie, and pop back in in the evening to turn it off and collect the complete system requirements. IT Marketing - It's a whole new planet. Recently, in "Technical Book Reviews"